Further to our energy saving blog about fitting reflective foil behind radiators, we have since come across a product called Radflek that does exactly what we were telling you about. It reflects the heat that would be absorbed by the wall behind the radiator back into the room. This saves energy and electricity for minimal effort and outlay on your part. In fact the manufacturers claim that they will pay for themselves within a year in the average household. The fact that Radflek reflects back 95% of the otherwise wasted heat has earned the product an Energy Saving Trust ‘Recommended Product’ Status. The manufacturers claim that it requires no DIY skills, and while we don’t like to think that our DIY knowledge is useless to you we know what they mean. You simply cut them to size, and then hang them from the existing brackets behind the radiator or, if you prefer, on self-adhesive hooks stuck to the wall. Radflek is a highly reflective laminated aluminium foil, that is treated to prevent oxidation, so it continues to be effective at reflecting the heat back into your room. If you do not have any form of reflective device behind your radiators, you can lose up to 40% of your heat from a radiator into the wall behind it. The reflective surface sends heat back into the room, and also back into the radiator itself, so that if you are using TVR’s the boiler is having to work less to achieve the desired heat in the room. In order to maintain the best possible reflective qualities the surface of the foil should be dusted from time to time. This can be awkward with foil that is stuck to the wall, but the Radflek system allows you to pull out the panel and dust it, then put it back easily. 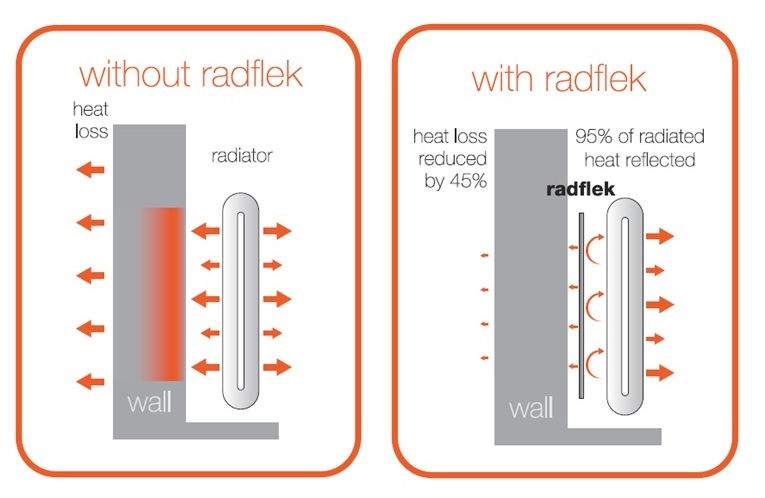 Tests on the product have been carried out by the BBA (British Board of Agrement), and verified by the BRE (Building Research Establishment), which show that Radflek reduces the heat transfer to the wall by 45% and it is 23% more effective than any other type of radiator reflector on the market in the UK at the moment, according to figures from Ofgem. In addition the BBA have certified that the product has a life of at least 60 years. So you can take it with you when you move house if you want and it should last you most of your life! As far as money-saving goes a sheet of Radflek will save up to 83 kWh of energy per year. For those of you interested in their carbon footprint that means a saving of 8.9 kg of Carbon Dioxide per year. Whereas similar sized saw-toothed reflectors will only save around 7.2kg of Carbon Dioxide, per year. Based on publicly available fuel price assumptions from the Energy Saving Trust the Radflek system should save you up to £40 in less than a year. Find out more from the Radflek website.